a project… a love… and suffering – Love God… Love People… Live Free! As I read these words I couldn’t help but draw the parallel to the endeavor my friends and I are about to engage in — the LIFEQUESTweekend retreat. The premise of our entire weekend retreat could have been drawn right from the words above. To put it into slightly different language, John Eldredge in Wild-at-Heart puts it this way: the core desires of a man’s heart are for Adventure, Beauty, and Battle. 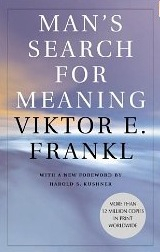 In Frankl’s words, a project, a love, and suffering for a reason. Where’s your Adventure/project? Many of us tend to wait for… (fill in the blank). Wait until the promotion… wait until the raise… wait until the timing feels right… wait until we know more… wait until things slow down… wait for life to get less busy… wait for the kids to grow up… wait for the next season… we wait for life to begin. We wait to engage in our “project”. It is exactly as Thoreau put it, “most men live lives of quiet desperation and go to the grave with the song still in them.” We long for something… and yet we wait for… something… to release us to sing the song living within us. Yet, too few live to see that day. And, what about love? Are you experiencing Love? Are you walking with others? Do you have some close friends? A close friend? I don’t mean people you hang out with, party with, talk “stuff” with. I mean, a “soul” friend. Someone who knows you, deeply, intimately. Your “3am” friend (the person you can comfortably call at 3am if you are struggling with an issue, need prayer, etc.) Are you known by another? Someone other than your spouse? ** The answer says something about your approach to life. If you’re unsure or already know that you do not have this type of friend in your life, then you’re at risk of living a meaningless life. We were never intended to travel this journey alone. And that is the message we are bringing to Men at the LIFEQUESTweekend retreat. Battle… Adventure… and Beauty. A strength gained in learning how our hearts are hard-wired to these desires… a strength gained by finding it in a God that alone can offer true strength… a strength gained to offer others. It is our desire to live to the full. And so, we will fight for the life Christ has promised. And, we will fight for the lives of those around us. ** Note: If you are married, I do believe it is critical that your closest friend be your spouse. But, I also think it is extremely important to have a close friend outside of your marriage. You can’t be everything to your spouse. As a husband, you can’t be your wife’s “girl friend”, she needs a peer to share life from a female perspective. In the same way, you need other men in your life. The same is true for you if you’re a wife. There are so many reasons why this is true. Previous Post Love… Again… and Again? !